The local tiki bar shut its doors for good this week, so to drown my sorrows I made myself a Mai Tai. I prefer a simple recipe when making my own cocktails (especially after a long day at work), so I went with the short version using the ingredients listed below, all of which (except for the lime and mint) can be sourced at Southern Spirits in Fort Mill, SC, just 30 minutes from home. 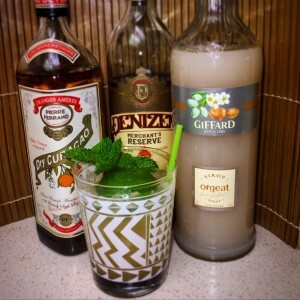 The Denizen Merchant’s Reserve is specifically blended to duplicate the flavor of the two rums used in a traditional Trader Vic’s Mai Tai, so it’s less expensive and quicker than using two different rums. The Pierre Ferrand Dry Curaçao is not as sweet as other curaçao, so it balances out the Giffard Orgeat nicely. 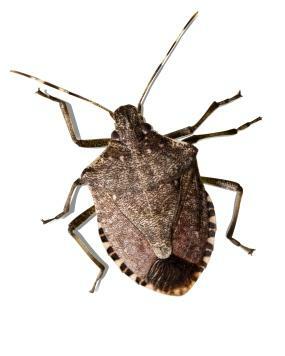 Sadly, as soon as I’d made myself comfortable on the sofa with my drink in hand, I heard a loud buzzing in my ear and spent the next half hour tracking a North Carolina stink bug around my living room before getting to enjoy my beverage. So it was a tad more diluted than I prefer, but even a diluted Mai Tai is better than no Mai tai. Use a short straw to get your nose into the mint upon approach. Click here if you want to see what I was chasing around my apartment.